This modern-day business parable, a quick read in the spirit of The Greatest Salesman in the World and The One Minute Manager, should do well with eager corporate-ladder climbers, who may at first be confused by its focus: on putting the other guy first-be it a colleague, competitor, customer, friend or family member. Told through the fictitious story of an ambitious young salesman named Joe, Burg and Mann communicate their points through the advice of an enigmatic (and highly likeable) mentor character known as Pindar. 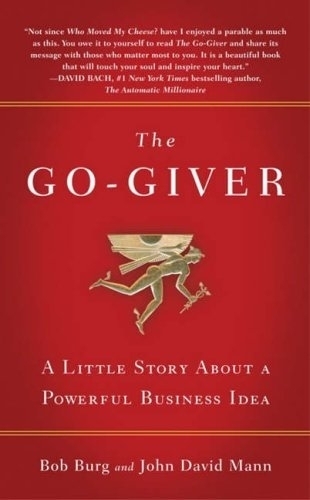 Rather than help Joe snag a fast sale, the consultant introduces him to series of "go-givers" who personify the "Five Laws of Stratospheric Success." Over the course of five days, a restaurateur, a CEO, a financial advisor, a real-estate broker and the mysterious "Connector" teach Joe about the laws of value, compensation, influence, authenticity and receptivity-concepts that make more immediate sense in this fictional context than they would in a formal business book. Burg (Endless Referrals: Network Your Everyday Contacts Into Sales) and Mann (You Call the Shots) write with a simple, informal style that offers a working-person's interpretation of the old adage "give, and you shall receive."